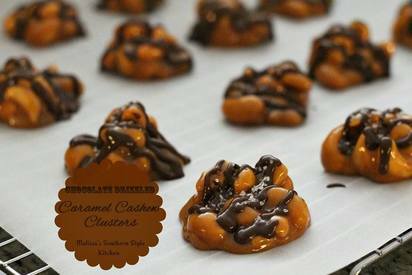 Chocolate drizzled caramel cashew clusters! It's National Cashew Day and caramel cashew clusters are simple to make and fun to eat. A drizzle of chocolate and a sprinkle of sea salt, adds the crowning touch! I’ve been dipping fruit and nuts in buttery caramel for as long as I can remember. Much longer than I’ve been blogging about my kitchen adventures. At times, I make my own homemade caramel, and at times, I may indulge in a shortcut. This recipe is one such shortcut treat, and it’s a time honored family favorite. These chewy caramel clusters taste and look far more fussy than they are to make, and I’m delighted to pass these along to you for your family to enjoy as well.